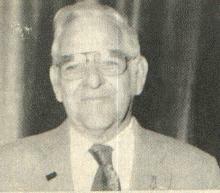 Clark W. Mellor of Worcester, Massachusetts was elected as Commander-in-Chief of the Sons of Union Veterans of the Civil War on August 17, 1988 at the 107th National Encampment held in Lansing, Michigan. Brother Mellor joined Camp #25, Sons of Union Veterans of the Civil War on May 29, 1942 in the Post #10 GAR Building, Worcester, Massachusetts. He claims his eligibility through his grandfather, Clark W. James, who served as a Private in Company K, 21st Regiment Connecticut Infantry until the end of the War, and was Honorably Discharged June 10, 1865. He has held every office in his Camp except Secretary and Treasurer. He was first elected Camp Commander in 1951, elected again in 1964, and still serving his Camp in that position currently. In the Department of Massachusetts, he has served in every office except Secretary and Treasurer. He also has served on several committees, and has been chairman of many of them. He was elected Department Commander in 1959 and again in 1984, Brother Mellor is currently serving on the Department Council. On the National level he has served as Guide; Color Bearer; Patriotic Instructor; Council of Administration for two years, Chief-of-Staff; Junior Vice Commander-in-Chief; and Senior Vice Commander-in-Chief. Brother Mellor is also: a 42 year member of Saint Bernard Church, a sexton for 25 years, and Chairman of the Explorer Scout Post 52 of Saint Bernards for many years. A 40-year member of Brookfield Post 530 Veterans of Foreign Wars, and a past Post Commander, he served in the US Army from 1939 until 1945. He and his wife Elizabeth (Betty) have one son, one daughter, seven grandchildren, and one great grandchild.